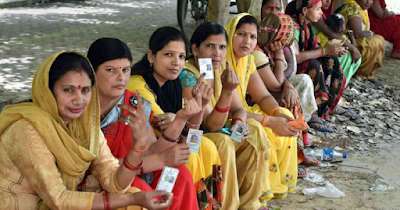 As per the data sourced from CEO (Uttar Pradesh) website today, there are a total of 1,40,76,635 electors in second phase including 75,83,431 men and 64,92,326 women electors. Of these eight seats, Agra is the largest parliamentary constituency with 19,04,706 electors and Nagina is the smallest one with 15,74,994 electors. The data sourced from ECI website shows that in previous General Election -2014, there were a total of 1,34,03,734 electors in these eight Parliamentary Constituencies. This means an increase of 6,72,901 (5.09 %) electors since last General Elections. The State of Uttar Pradesh has a total of 14,40,61,892 electors (Overseas Indian electors and service electors are in addition to these) in its all 80 Lok Sabha constituencies. The State is going through seven phase polling in the current General Elections -2019. In the first phase, voting for the eight Lok Sabha seats has already taken place on April 11th, 2019 and voting for phase-II is scheduled for 18th April, 2019.